Okay, guys and gals. I'm going to be up front with you. I'm totally cheating on these awards. No, I'm not saying I awarded myself, I'm saying that I'm not going to be able to fulfill all of the stipulations that come along with them. Specifically, I'm not going to be passing them along. I know that's kind of the point of these things, to point your readers in the direction of fellow bloggers they'd enjoy, but on the last couple of awards I've received, I couldn't help but get the feeling that a couple of the folks I nominated were a little skeeved out by the whole thing. I think these feel like fancy chain letters to some people, and I get that. And since I just passed along the Kreativ Blogger to a bunch of awesome people yesterday, I'm going to accept these two with an asterisk attached, mainly as a thank you to the fine folks who gave them to me. If that means I don't really get to put them on my mantle . . . well, you'll have to pry them from my cold, dead hands! However, it's just not fair that I get to receive awards without passing them along myself, so I'm afraid this will be my final post accepting awards for my blog. In the future, I'll be reluctantly declining any blog awards tossed my way. AuthorAlden.com is henceforth an "award free" blog. I sincerely appreciate anyone who thinks my little blog deserves any kind of praise. You people are awesome. On with the Ceremony . 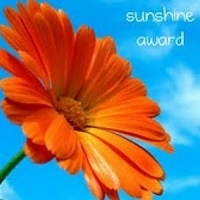 . .
From Rafael R. Piñero & Veronica Sicoe comes the Versatile Blogger Award, and Paige Lollie & Charity Faye have bestowed the Sunshine Award. My utmost thanks to them both for thinking of me. I urge you all to go check them out, as they both have great blogs you should be reading. Really! Go! Read! Both of these awards require that I offer seven random facts about myself. Since I'm already cheating on these, I think I'll corrupt the spirit of the awards even further by combining them both into one. I'm so clever! In case you haven't noticed from all of the references in my entries, I'm an avid gamer. I have a pretty wide taste when it comes to genres, but my favorites are RPG's and old school point-and-click adventure games. In other words, I like the games that tell the best stories. I have a growing collection of swords that hang on my office wall. If I'm ever filthy rich, I'm going to fill an entire room with medieval armor and weaponry. I'm kind of a theme park junkie. I've been to Universal Studios/Islands of Adventure more times than I can count, in addition to a few trips to Disney World, Sea World, and Busch Gardens. Most of the time, I wear glasses. The first job application I ever filled out was for a famous skate park that later became a level in one of the Tony Hawk video games. I lived right down the road from it, and people would park on my lawn whenever he would come into town for a demo. I hate cooking. Hate it. If I'm feeding myself, it's safe to assume it's been microwaved. Starting tomorrow, I'm officially on vacation. Mostly, I'll be relaxing at home and getting some writing done, but not before a nice little trip to Kennedy Space Center. And there you have it. Once again, a big thank you to Rafael R. Piñero and Paige Lollie for the awards. The next time you hear from me, I might have a flash story for you to read. I'm participating in the Absolute Write blog chain again this month, and as soon as my turn is up, I'll be sharing my own little slice of the zombie apocalypse. Congrats on two more blogging awards. What story-driven video games are your favorite? I have a list a mile wide of favorite games. My favorite game series of all time is the Monkey Island series (with the Curse of Monkey Island being my favorite), but some other favorites have been Portal, Mass Effect, Dragon Age, Elder Scrolls, Fallout, the Longest Journey, Assassin's Creed . . . the list goes on and on. It's not just RPGs and adventure games that I like; I can get into pretty much any type of game as long as it has a great story (and if it's fun enough, it doesn't always need that either). I was chewed out this morning for giving someone an award--so, sadly I will not be passing any more along, either. I feel bad because it seems like a nice thing to do and gives people additional hits-- but hey, what can ya do? Sorry to hear that, Randi! I didn't get chewed out by anyone, but I just got a feeling that some people seemed bothered by it. You're right, it's coming from a good place, for sure. I guess some people just aren't into it. Like you said, what can you do? Two more awards. Congrats! Medieval armor and weaponry. You're a brave one. Thanks, Maurice! I'm not that brave, it's just that most of my fictional heroes since I was a kid were swinging swords around. To this day, medieval settings in stories bring out the kid in me. You're going to the Kennedy Space Center?! I hate you. I contemplated waiting until Saturday so I could watch the SpaceX launch, but turns out it's launching at like five in the morning, and it's a couple hours drive from my place as it is. But it's my first visit, despite living in Florida all my life, so I'm excited.